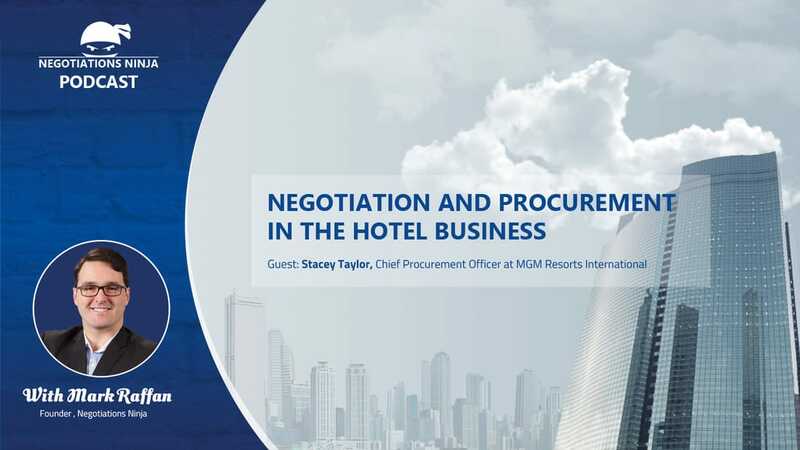 Stacey Taylor, SVP & Chief Procurement Officer of MGM Resorts International, and I talk about the unique procurement and negotiation challenges that exist in the hotel and casino business. With nearly 30 years of experience in procurement, she has a unique understanding on procurement. She’s served in procurement leadership positions with ConAgra and Tyco and serves on the board of ISM and as an adviser to COUPA and WRMSDC. We get into a great conversation on unwinding consolidated deals and the effort and strategy required to ensure that you have enough sources of supply to go to if you unwind a consolidated deal. It was a super interesting conversation and Stacey gave so willingly of her wisdom. Also, I think she’s going to write a book! And you heard it on this show first! It was an absolute pleasure having her on the show.